In this post is shown how to uploading a file (e.g. an image) using Ajax with a Spring Boot web application server side. JQuery will be used client-side to simplify our life. * Upload the file sending it via Ajax at the Spring Boot server. Server side we need a Spring Boot controller listening for an HTTP POST at the url /uploadFile. The controller’s method handle the uploaded file saving it locally in the filesystem. * POST /uploadFile -> receive and locally save a file. * "name" in the input tag with type file. Spring Boot takes some optional configurations in order to limit file sizes. You can put them in the application.properties file. # unlimited set the multipart.maxFileSize property to -1. Take a look at the first reference (https://spring.io/guides/gs/uploading-files/ ), there is an example that sends an html text input (name) along with the file… It should works simply adding a RequestParam in your controller handling others inputs, but I didn’t tried it.. Let me know if you make a try. stream.close(); But it gives me an error but when i change aa location to a local one like F:/ , it works , what am i doing wrong? Take a look here http://stackoverflow.com/a/20720866 or here http://stackoverflow.com/a/19923744 and try to use the ServletContext to get the current path of your web application. However I discourage you to saving files inside your web application, it’s better to keep well separated the application itself from its contents. It will be simple to maintain and update in the production environment. Thank you but how can i save the files in tomcat server without creating a folder in static . i am really confused .Can you help? You should save files outside the web server, e.g. in /var/netgloo_blog/uploaded_files/. Hi. Andrea. Thanks for your post. Could you please tell how to manage this situation about where to save the files. In production enviroment normally you deploy the web application in a tomcat server (my case) and it should work without create folders in that system (eg: ubuntu server, windows server, etc.. ) Usually you don’t have access or permission. Hello David, probably there is not a right answer suitable for any situation. Anyway I think that for web applications a nice place is a storage folder placed in the project’s root directory. When you save the file you should retrieve the path of such folder dynamically or save the path within the configuration file (application.properties). If you are using git you should add such folder in the .gitignore. Hi Aghil. I’m sorry, but your code seems very different from that in my post. I don’t know how to help you. Did you tried to post a question about your problem on stackoverflow? Thanks for your reply. I already post my question in stackoverflow but no reponse yet. Actually you tried to upload file through rest controller. In mine, i tried to upload to file through bean class. But when i mentioned the enctype in my form so that the file will bind with the request and send to the method, this time the method is not getting called. I will try to implement it in rest controller and let you know. Meanwhile if you sort out the problem. please update me . thank you again. I tried to upload file through rest mode and its works fine. Thanks for your help brother. And i will also check how to upload file through bean and update you. can i use this in android app development? for printing submitted form details in spring boot console? or can u explain me how i print my android app form submitted details in spring boot console? Hi Jiten. Do you want receive the form on the android app or do you want send a form from android to a web server (running spring boot)? my question is -> you can submit the registration or login form from Android App and you should then print the submitted value in SpringBoot console using System.out. Sorry, but I have not experience with Android apps. 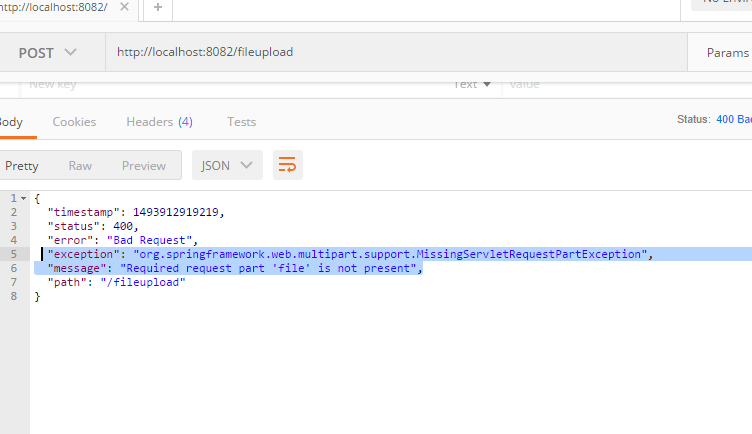 But, server side (where is Spring Boot) you can receive an HTTP POST request and to do that you can see simpler examples than mine, like this one. From the Android app you should simply send a HTTP POST to your server and to do that I would take some ideas from here or here. Finally, if can help you, in this post I described how you can print some logs in the spring boot console. would be great for you, an example of how ManyToOne relations with spring boot etc are handled. I would like to return a category each with its products that you own. Seller faultless jackso. How to insert path in DB ? On this other post we explained how to store data in DB (MySQL) with Spring Boot: http://blog.netgloo.com/2014/10/27/using-mysql-in-spring-boot-via-spring-data-jpa-and-hibernate/. You can try to integrate the code of the two posts. Thanks, brief and perfect post! Hello Herculano, better you ask on StackOverflow about your issue, giving more details as possible (your project structure, where you are saving the file, the log if you are getting some errors). You can leave here a link to your question on StackOverflow so I will take a look if I’m able to help you. I tried to test this rest controller with postman in order to use the link in angular2 , but i’m gettin’ this error. So please can you help me to resolve this problem. Hello, please use Stackoverflow for problems (then you can leave a comment here with the link to your question on Stackoverflow). i always error if i use angular2. is it my angular2 code error, or perhaps i have to change to backend code? Hello Dedy, please use Stackoverflow for problems and/or questions. Then you can also put a link here to your question and I will be glad to help you if I can. Thank you.